The Socialist Party of North Carolina (SPNC), formed in 1996, is the modern affiliate of the national Socialist Party, which was organized in July 1901 by the merger of the Social Democratic Party, under Eugene V. Debs, with the reformer wing of the Socialist Labor Party, under Morris Hillquit. The SPNC has small, organized groups in Raleigh and Jacksonville. In the 2000 presidential election, for the first time since 1936, a Socialist Party member was an official write-in candidate in North Carolina. In the early 2000s the SPNC was involved in a variety of causes, including a boycott of Mt. Olive Pickles and People of Faith against the Death Penalty. Again as a write-in, the national Socialist Party presidential candidate in 2004, Walter Brown, received about 300 votes in North Carolina. 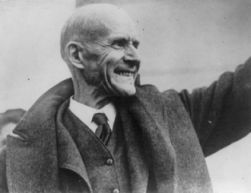 Eugene V. Debs, 5 times Socialist candidate for President, set free from prison on Christmas Day, December 25, 1921. Image courtesy of Library of Congress. Available from http://www.loc.gov/pictures/item/2002697720/ (accessed August 6, 2012). Does anyone know where their buncombe county precinct is? I'm new the Socialist Party and would like to get involved with people of like mind, protest and civil-disobedience. How do I join? What candidate does the NCSP support? Thanks for visiting NCpedia and posting your question. Your question was posted on an entry about the NC Socialist Part in the NCpedia, the encyclopedia of North Carolina. For more information about the NCSP, you may wish to visit their website: http://ncsocialistparty.weebly.com/. I would like information on any meetings or activities in Charlotte area. Thank you!